Welcome to the web site of Argonautics Marine Engineering, Inc., a leading marine consulting company specialized in marine heavy-lift transportation, marine surveying and naval architecture. With involvement in over 600 successful projects of all sizes since the start of operations in 1992, our extensive engineering capability combined with hands-on field experience benefits both our existing and future clients. 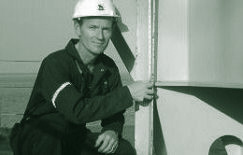 Argonautics Marine Engineering, Inc.: Practical Solutions - Theoretically Sound. Below are links to the various services we offer and types of projects we are involved in, as well as some of the more newsworthy announcements. 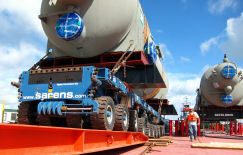 For the barge offloads of refinery parts at Cherry Points, ballast plans and on-site assitance was providede. 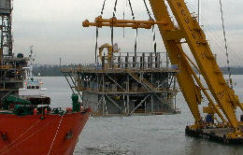 The seafastenings of the new Houston Bayport STS cranes were surveyed and approved at the ZPMC yard on Changxing Island. The last 288 ft span of the old San Francisco - Oakland Bay Bridge was successfully lifted off its pillars by a catamaran barge and moved to the scrap location. We are proud to have been involved by providing peer review of all marine operations. Two Liebherr mobile cranes and one Kocks STS crane were successfully relocated by barge from one terminal to another in Philadelphia in late February 2017. Argonautics Marine Engineering, Inc. provided the load-out ballast calculations and lashing design. All GINA KROG modules were safely delivered to the offshore site and installed onto the jacket by the dual crane vessel SAIPEM 7000. Success at last! In April 2016, the 5-th attempt to land the first stage of the SpaceX Falcon 9 rocket onto a drone barge was succesful. We provide third party independent review for the various marine works inolved with the demolition of the old SF Bay Bridge. The 504 ft long truss spans will be lowered onto cargo barges in early 2016..